Sometimes blog posts that I’ve written months or even years ago still receive comments from time to time. Such is the case for anything I’ve ever written regarding the best amusement park of all time, Storytown / The Great Escape. Last night, I received a Facebook message regarding one of those blog posts. And sadly, it’s one that I feared I would receive someday – one of the icons of my childhood has finally ridden into the sunset. The message is from Danielle Corning, who grew up as a neighbor with the McKay family. Thank you posting the slide show of Storytown. I am collecting websites and photos and footage of Bill and his partner Lady Marshal Tommy Atkins. I was Wild Windy Bill McKay’s neighbor growing up in Lake George. And to this day a very close family friend. There is little footage of him doing what so loved doing for 50 years… entertaining children. Sadly, yesterday, July 8,2011 “Uncle Bill” passed away at age 90. Tommy was also a close family friend and passed away a few years ago.Few people knew Windy Bill as I did yet he touched so many lives in his dedication to music, children and entertainment. He was heavily involved with Jerry Lewis’ MDA marathons in Schenectady NY, was one of the Son’s of The Pioneers Country/Western singing group with Roy Rogers and was friends with Roy and Dale. But most of all he was my friend and honorary “Uncle Bill”. He bought me my first pair of cowboy girl boots and taught me how to ride when I was 6. He gave me his love of music and horses and today I am a musician and rider. I’m absolutely crushed. Every time I visited the Great Escape and Splashwater Kingdom – especially back in the days when it was Storytown U.S.A. – one of the highlights of my trip was to visit the section of the amusement park known as Ghost Town. 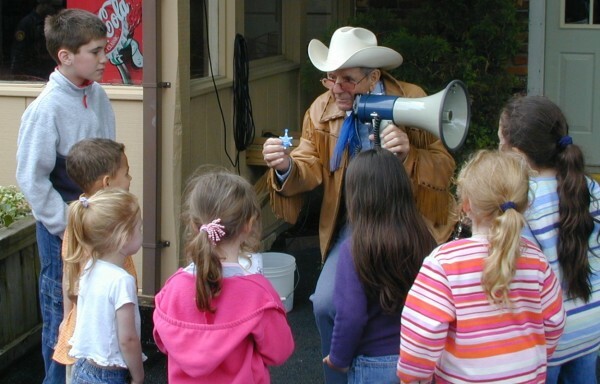 And like every other kid who visited Storytown, I was deputized by Wild Windy Bill McKay during one of the Ghost Town stage shows. We were told we were going to make mashed potatoes out of the varmints who robbed the Ghost Town Bank – and sure enough, we did; we defeated the bandits, as did the kids earlier that afternoon and did the kids two days later. Here’s a picture of Sheriff McKay, as gleaned from an old Kodachrome slide, circa late 1960′s. 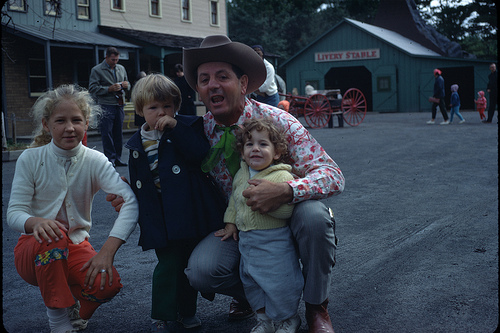 Sheriff Wild Windy Bill McKay at Storytown U.S.A., circa mid-1960’s. Photo taken by Doris Robinson; from the Chuck Miller collection. A few years ago, I returned to Storytown – now the Great Escape – on to write an article for RoadKing magazine on the theme park’s 50th anniversary. I interviewed Wild Windy Bill McKay, who told me about how much admiration he had for park founder Charles Wood, as well as the support Wood gave for the various park areas. During the interview, he again kept the bad guys from robbing the bank. And afterwards, several more children were deputized as junior marshals – that year, instead of yellow badges, the kids received blue badges, to commemorate the theme park’s 50th season of operation. Wild Windy Bill McKay handing out marshal badges to new junior marshals. Photo by Chuck Miller. 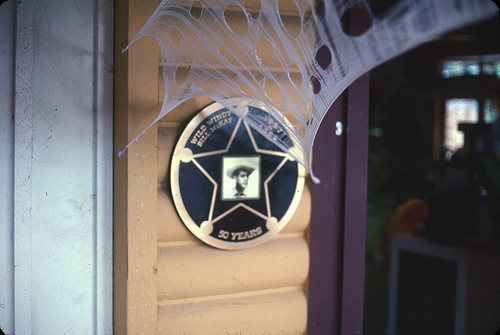 Last year, when I visited The Great Escape as part of my Kodachrome photography project, I saw a marker on the side of the Ghost Town Marshal’s office. The marker commemorated McKay’s long tenure with the park; and inside the Marshal’s office was a larger, heartfelt tribute – pictures of Marshal Wild Windy Bill McKay with many of his junior deputies. Pictures that were taken years ago and pinned on the wall of the Marshal’s office, in grateful tribute from generations of kids and parents. The only remaining sign that Wild Windy Bill McKay kept Ghost Town safe from all the bandits that showed up four times a day. Photo by Chuck Miller. At the time, I didn’t know what had happened to Wild Windy Bill McKay, other than the was retired from the park. Today, unfortunately, I found out that the sheriff that kept Ghost Town crime-free for 50 years passed away last Friday. He was 90 years old. For five decades, he and Ruth Buckley – who was “Lady Marshal Tommy Atkins” – not only entertained thousands of kids every year at Storytown / The Great Escape, they also appeared at the WRGB Muscular Dystrophy Labor Day telethons. Buckley passed away in 2000; McKay kept in constant contact with Buckley’s husband for years after that. This Times Union profile of McKay, written in 2007 by Tom Keyser, is a fascinating read about the long-time marshal of Ghost Town. Rest in peace, Marshal Wild Windy Bill McKay. Thank you for all the great memories you provided to me and all the other kids who visited Storytown / The Great Escape and Splashwater Kingdom. This entry was posted in In The News and tagged Chuck Miller, fairytale theme parks, ghost town, great escape, lake george, lake george new york, Marshal Wild Windy Bill McKay, roadside attractions, six flags great escape, storytown, storytown usa, the great escape, Times Union. Bookmark the permalink. the children and also grownups that he touched.